Mattie does not have any disabling injuries, she is a human imprint. Mattie came from Brecksville when she was just a baby vulture. The tree she and her parents were living in was cut down, causing her parents to leave abruptly and abandon Mattie. When the tree went to the saw mill, the workers heard hissing sounds coming from the tree and found her. She was brought back to health by the Medina Raptor Center in 1998 and released, but a few days later the Center received a call saying a vulture was coming up to people. This was Mattie and it was determined that she had imprinted. She now remains at the Center as an educational ambassador for her most beautiful species. Although it has an ugly, bare-skinned face, the Turkey Vulture is beautiful on the wing. Seldom does this graceful and talented bird flap its wings as it soars over large areas searching for carrion. Flight feathers on wings appear silvery-gray underneath, contrasting with the darker wing linings. Relatively short, hooked bill ivory-colored. Soars for long periods, flaps wings infrequently and slowly. While soaring holds wings slightly up in a V shape. Sexes appear similar, but female slightly larger. Winters from northern California, Mexican border, eastern Texas, southern Missouri, and southern New York southward throughout the southeastern United States and south. Prefers rangeland and areas of mixed farmland and forest. Roosts in large trees or on large urban buildings. 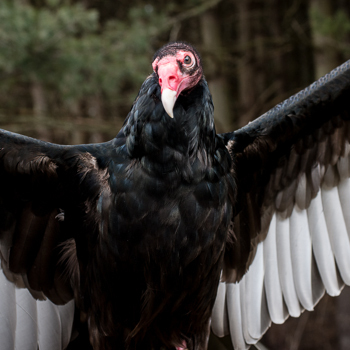 Soars over large distances and detects carrion by sight and smell. No nest structure. Puts eggs directly on ground in caves, crevices, mammal burrows, hollow logs, under fallen trees, or in abandoned buildings. Creamy-white with dark blotches around large end. Downy and helpless. Unable to hold head up, but can hiss. Overall North American populations have increased over the last few decades and the breeding range has expanded northward. Usually silent. Makes hiss at carcasses, roosts, and nest.